JUST TWO DUBLIN postcodes have an average house price that is below a quarter of a million euro. That is the finding of the latest GeoDirectory report, a joint venture by An Post and Ordnance Survey Ireland (OSi) to create and manage Ireland’s only complete database of commercial and residential buildings. While the national average house price in the 12 months to April this year was €273,206, with Dublin excluded, that falls to €198,906. In the capital, the average price of a house is €413,891. However, in just two areas of Dublin – Dublin 10 and Dublin 17 – can you expect to pay an average of less than €250,000. The county with the lowest average house price was Longford at €101,587, almost 50% below the national average price excluding Dublin. The report also shows that despite housing demand, the average vacancy rate stands at 4.8%, down just 0.1 percentage point on last year. Leitrim registered the highest residential vacancy rate in the country at 15.9%. Dublin, Kildare, Meath and Wicklow recorded the lowest percentages of vacant units in the country, at rates between 0.9 and 3.5%. The report found that 9,251 buildings are currently under construction, a rise of 55%. “The twelve months to June 2018 saw a significant increase in terms of residential construction activity. The report shows that the vast majority of this activity is taking place in Dublin and surrounding counties. However, despite this increase, house prices in urban and commuter counties continue to rise, showing us that demand is still outweighing supply by a great deal. 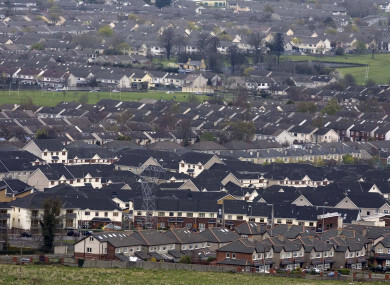 The report shows that there were 1,983,715 residential dwellings in Ireland in June 2018. Out of this total, detached dwellings accounted for the largest share at 34.8%, followed by terraced dwellings (27.6%) and semi-detached dwellings (24.3%). There are 180,741 apartments in the country, representing 9.1% of the overall total. Email “The average house price is lower than €250,000 in just TWO Dublin postcodes”. Feedback on “The average house price is lower than €250,000 in just TWO Dublin postcodes”.